110 min. Universal. Director: Alex Kurtzman. Cast: Tom Cruise, Sofia Boutella, Annabelle Wallis, Jake Johnson, Russell Crowe. Mummy mia...here we go again. Universal has thrown all in to its plans for a “Dark Universe” monster-mash-up franchise, on the theory that what worked before will work again: namely, Frankenstein’s monster, Dracula, the Wolf Man, the Invisible Man, et al. After all, Universal is the house the monsters built, back in the Golden Age of Hollywood. All of these monsters have been revived already umpteen times, of course, but strangely enough, none more successfully than the Mummy, which spawned a 1999-2008 trilogy (not to mention the Scorpion King spinoffs). 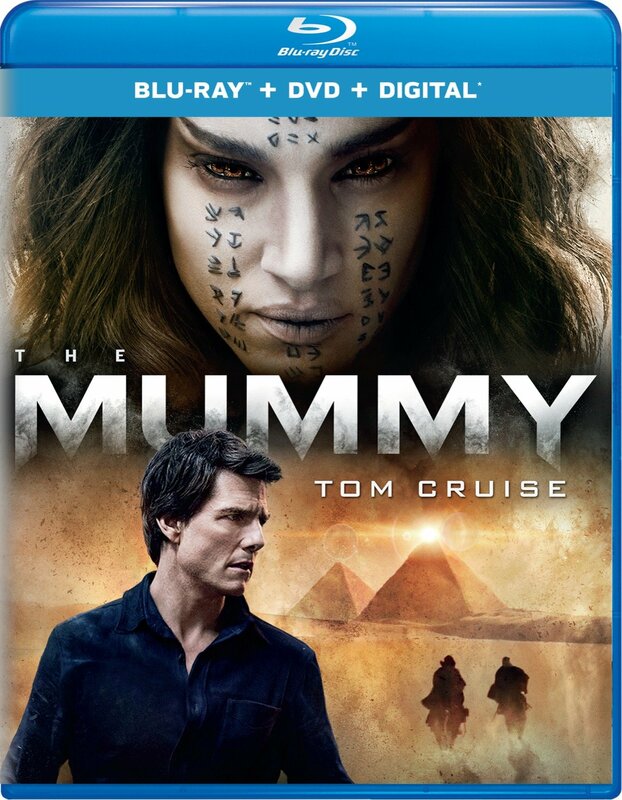 This time, Tom Cruise anchors The Mummy with a big budget, hooey in bulk, but a conspicuously hollow script. It comes as a bit of a shock that the film’s screenwriters include heavyweights David Koepp (Jurassic Park) and Christopher McQuarrie (Oscar winner for The Usual Suspects), along with actor Dylan Kussman and three writers given “Story” credit: Jon Spaihts (Doctor Strange), Jenny Lumet (Rachel Getting Married), and the film’s director Alex Kurtzman (Star Trek). That’s enough writing talent to suggest that the awfully clunky results owe to too many cooks in the kitchen serving, to mix a metaphor, two masters: Universal and Tom Cruise. Cruise plays antiquities thief Nick Morton, and oh boy, is he some rascal! He forces his sidekick (Jake Johnson) into insanely dangerous situations (a firefight in Iraq laced with bickering-buddy comedy), beds a woman (Annabelle Wallis’ ancient-Egypt expert Jenny Halsey) only to sneak off with her buried-treasure intel, and generally insists that he’s conspicuously “masculine” (referring to the titular character as “the chick in the box”). He also gets the requisite shirtless scenes and ranks highly enough over Oscar winner Russell Crowe to make him say to Cruise’s character, “You are a younger man” (for the record, Cruise is three months older than Crowe in real life). Yes, Tom Cruise, you are very manly, but do we have to watch this movie? Very long story short: awakened-evil-ancient-princess mummy (Sofia Boutella) wants to give human form to God of death Set, curses Cruise, wreaks havoc. Very long story shorter: you can keep this Mummy under wraps. As a story to speak to our hearts and minds, it's an utter failure, and perhaps so too even as a disposable corporate product. Global audiences will tell, but for the long run, Dark Universe looks like it could be a very expensive mistake. Universal's domestic Blu-ray release of The Mummy doesn't include the 3D version of the film—for that, you'd have to import from the U.K. or elsewhere—but the disc does provide top-notch 1080p DOlby Atmos A/V and quite the complement of bonus features. The transfer, sourced from a 4K master, looks terrific in 2K. Universal also offers a 4K edition, but unless you have a massive television, it's hard to imagine you'll see much difference. Contrast and color are perfectly calibrated, and black level is excellent for a clean and stable image. The only complaint with the picture owes to the source: the often unconvincing CGI. The Dolby Atmos mix is state-of-the-art in its placement of sound and overall fidelity, with dialogue nicely prioritized. Rumbling LFE adds power to the action sequences, the bombastic score gets a full-bodied treatment, and atmospherics impressively immerse from all angles. An audio commentary with director Alex Kurtzman and actors Sofia Boutella, Annabelle Wallis, and Jake Johnson has the rare novelty of most of the participants sitting down to watch the film for the first time. Their excitement and camaraderie are palpable, making this a fun "party track" that also provides quite a bit of information about the production (including set anecdotes) and Kurtzman's intentions. Four "Deleted/Extended Scenes" (4:52, HD) don't amount to much, but "Cruise & Kurtzman: A Conversation" (21:15, HD) provides another fascinating opportunity to see one of Hollywood's greatest showmen (that'd be Tom Cruise) hawking his wares (and fielding complements from his director). "Rooted in Reality" (6:52, HD) finds Kurtzman and Cruise—as well as producers Chris Morgan, Jeb Brody, and Sean Daniel, writer Jon Spaihts, art director John Hutman, and Russell Crowe—talking up the film's supposed grounding in 21st century truth, among digressions. "Life in Zero-G: Creating the Plane Crash" (7:32, HD) allows director Alex Kurtzman, producer Jeb Brody, Cruise and Wallis to pull back the curtain on the film's most memorable (and most Cruise-y) action sequence. "Meet Ahmanet" (7:39, HD) profiles Boutella and her character, with Kurtzman and Cruise chiming in. "Cruise in Action" (6:09, HD) doubles down on looking at Cruise's penchant for stunts, with the star, Kurtzman, Brody and Daniel, Wallis, Johnson, and Boutella participating. In "Becoming Jekyll and Hyde" (7:10, HD), Crowe addresses that topic, with additional comments from Brody and Daniel, Kurtzman, production designer Dominic Watkins, Cruise and Wallis. "Choreographed Chaos" (6:35, HD) examines the London locations shoots, including those at the Natural History Museum and on actual streets. Watkins, Kurtzman, Brody, Cruise, Wallis, and Boutella participate. "Nick Morton: In Search of a Soul" (5:43, HD) allows Cruise, Brody, Kurtzman, and Wallis to discuss Cruise's character. "Ahmanet Reborn" (3:52, HD) may help those confused by the plot, as this brief animation explains the villain's motivation. All site content © 2000-2019 Peter Canavese. Page generated at 04/18/2019 01:22:30AM.